My mother never threw out a shoebox at the back of my closet floor with the complete set of Topps baseball cards for the 1958 season inside – a treasured collection that our son will inherit. Later in life, I resumed the habit of filling shoeboxes – this time with 4×6 file cards to help me organize my thoughts for writing projects. These cards have gained value over time as my memory has become spotty. What’s the point of reading so much if you forget most of it later? These 4×6 cards also helped launch my career as a blogger on ArmsControlWonk.com. I have again pulled together my weekly posts for 2013 into an e-book. Another year, another 40,000 words. Perfect for mass transit. And to remind me of forecasts gone awry. You can find this e-book at Amazon.com. This collection is a bit different from prior years — there’s more opinion and less delving into the file cards for quotes. With the onset of social security checks, I’m either getting more opinionated or less interested in pedagogy. This collection has a somber tone. The very first post, “Portents of a Difficult Year,” regrettably proved to be correct. There was a very brief moment of optimism with President Obama’s speech about deeper nuclear reductions in Berlin mid-year, but Vladimir Putin squelched that in a matter of days. 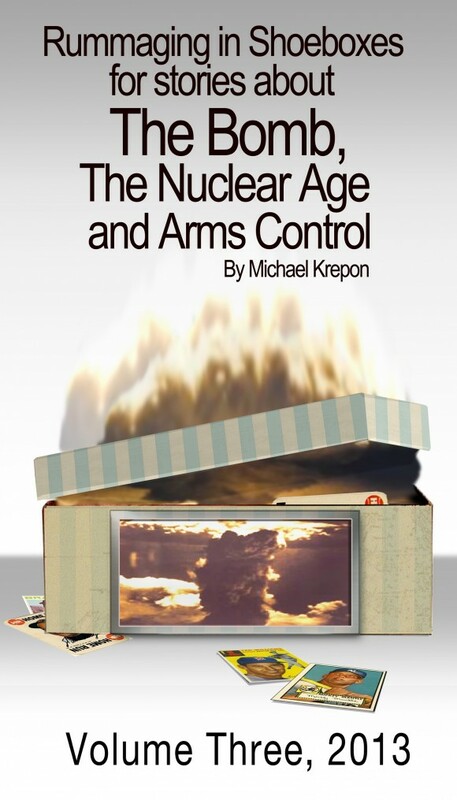 Several of these posts explored the possibility of a future of improvisation and informal nuclear constraints, rather than new treaties – as a matter of necessity rather than preference. Nor was I very upbeat about nuclear trend lines on the subcontinent, the region where I focus on the most. Ambition and hope waned over the course of the year. A new Indian Prime Minister offers a new start for improved relations with Pakistan, but this can be short-circuited quickly by another spectacular act of terrorism or lesser squabbles. As troubling as 2013 was, it was merely the prelude to more bad news in 2014 – but more of that later in volume four. More than a hundred cities and strategic military sites were singled out as potential nuclear attack targets for the Russians in the 1970s, secret Government documents have revealed. Swansea, York and Coventry were among the cities seen as ‘probable’ targets in the height of the Cold War which if carried out to its full potential would have left Britain ‘a heap of cinders’. But although London, Bristol and Manchester were included on the list of 38 cities and towns, the likes of Brighton, Oxford and Aberdeen were left off, according to a chilling ‘top secret’ report unveiled by the National Archives. —From “Stars and Stripes” and “Military.com”. —Could you do some thinking about this new set of claims, in light if earlier ACW postings on this subject? —As I said about Assad and chemical weapons: they can protect you form foreign enemies, but they cannot protect you from yourself. The GAO, in a report released on June 10, did not estimate the exact size of the undercount. But it said the Pentagon had wrongly omitted from its formal estimate of nuclear-related work the projected costs of modernizing the U.S. ballistic missile and bomber forces, which the budget office has said may total $64 billion over the next decade.